Chef Curtis Luettel seved samples at Albion ThriftyWay. Several of Albion’s downtown businesses held special pre-holiday events last Friday night, Nov. 3, to kick off the season. 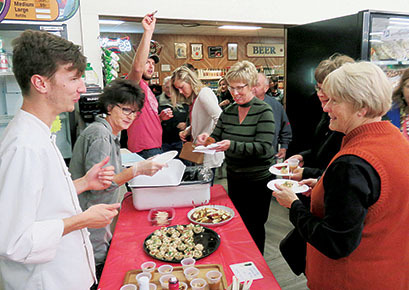 Albion ThriftyWay hosted its annual Wine and Spirits Tasting, and they were joined by Heartland Jewelry, Timeless Floral Rentals & Decor, Wells Hallmark, Barn Wood & Brushstrokes, Gray Haired Trout and others. Several new and home based businesses joined in with booths at ThriftyWay.